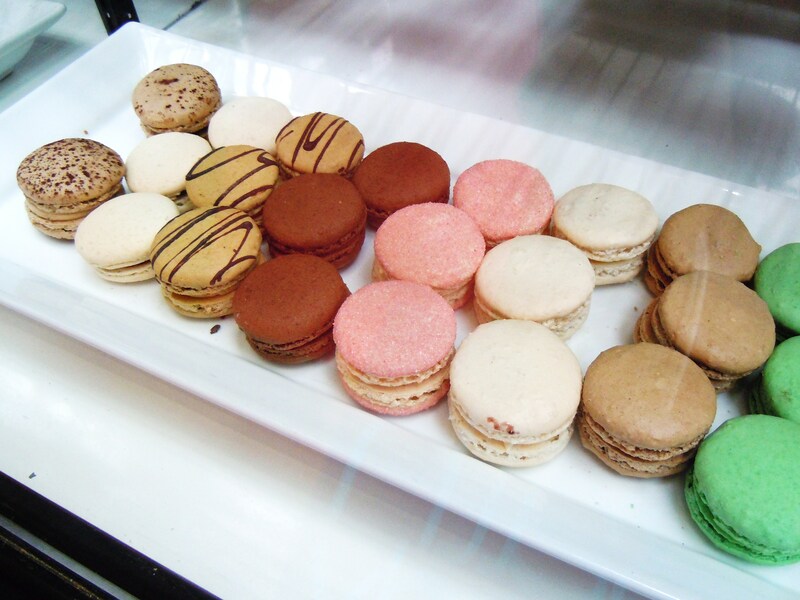 The Macaron Day Toronto Adventures! 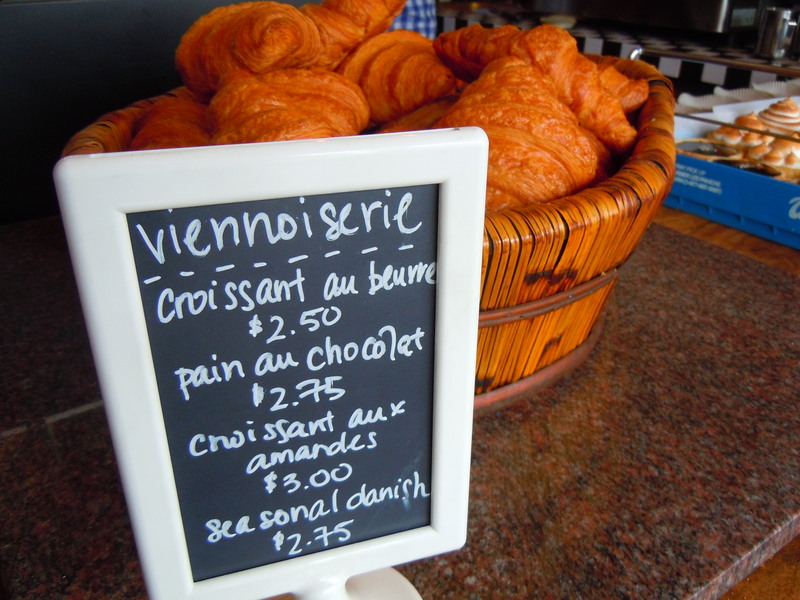 A Journey Through Rahier, La Bamboche, Yorkville Espresso Bar & More! Happy Easter, everyone! Ah, the celebration of all things pastel, and the sights, sounds, smells, and tastes of spring. Even if you don’t celebrate Easter religiously, I hope everyone was able to enjoy the long weekend with some yummy eats and adorable Easter themed things like chocolate, marshmallow, bunny, or Easter egg desserts! 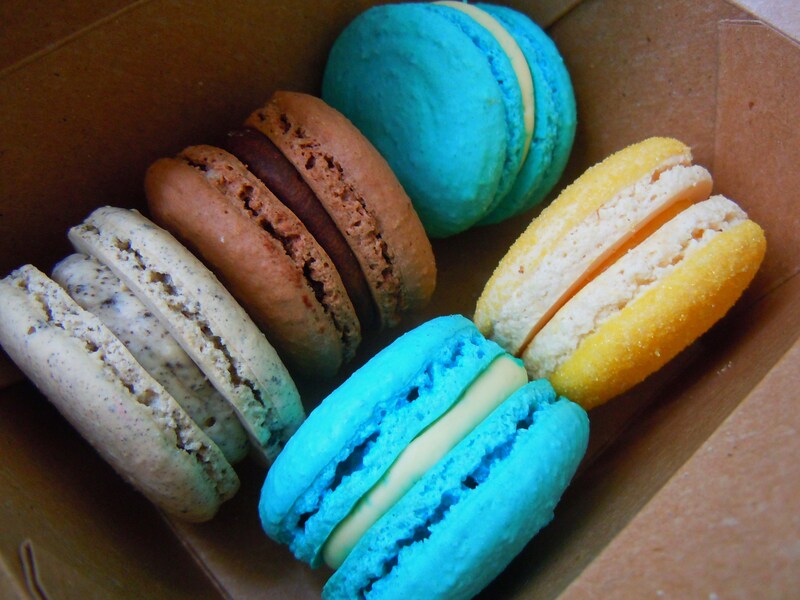 Or in my case, Easter themed macarons. OH. MY.GOD. Macarons decorated like baby chicks and Easter eggs with lemon and custard filling! Check out Ate by Ate’s Facebook page and you’ll know exactly what I mean. They’re one of the most adorable things I’ve ever seen (and so yummy), courtesy of Daniel et Daniel in Cabbagetown just for Easter. 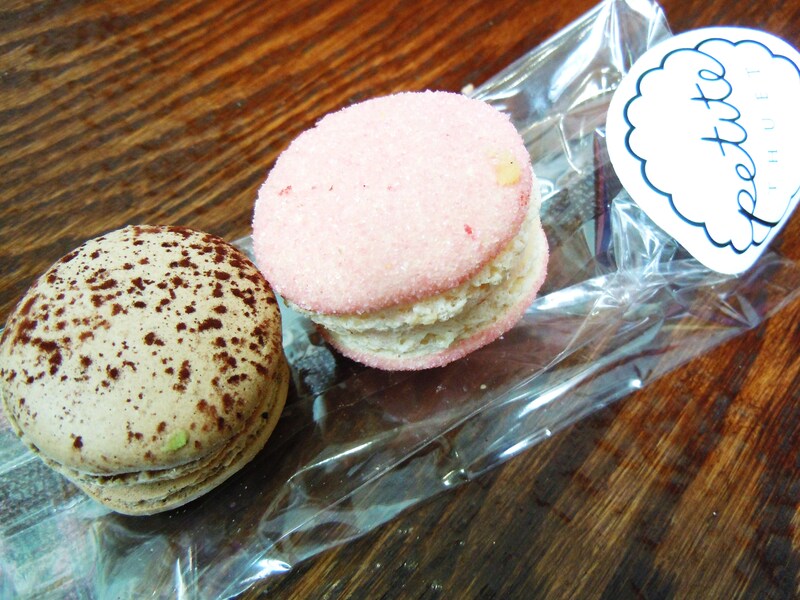 And speaking of macarons, I FINALLY get to share more from my day of adventure on Macaron Day. I know I’m really late but I figure since we’re still waiting on baited breath to find out how much we raised for Red Door Family Shelter, my Macaron Day escapades are still very much relevant. It felt so good being that focused and the adrenaline just kicked in – editing photos, finding content, seeking out updates and posting on the Facebook page 7 times a day. 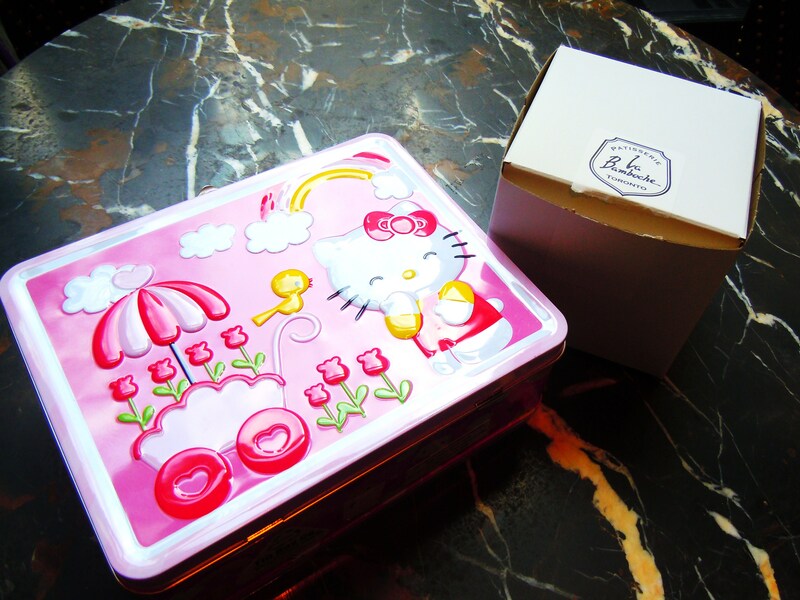 And on that Wednesday, my heart felt so free hopping around town visiting patisseries, getting on and off the subway left, right, and centre, collecting macarons and tucking them away in my Hello Kitty tin lunchbox (yes, that’s right, I carried a number of macarons in a Hello Kitty tin lunchbox – they needed protection from getting squished and crushed! 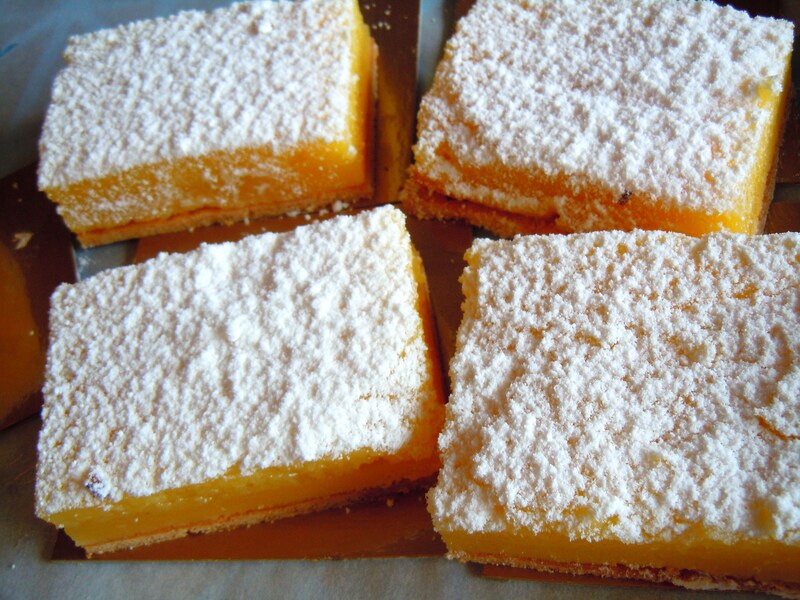 ), and eating them ALL DAY LONG! I made 5 stops this year; 1 more than 2012! I started out east and went straight down Yonge Street, hitting up a bunch of spots I didn’t hit last year. 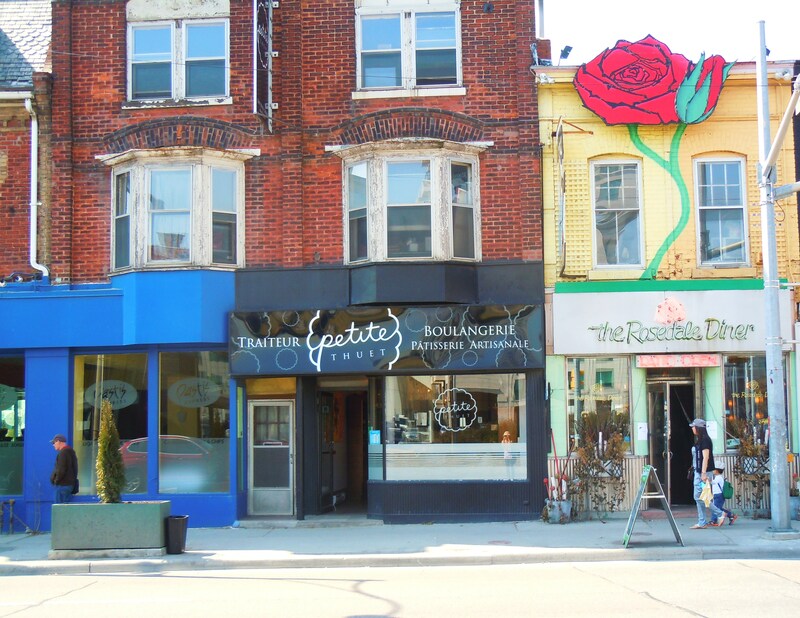 It was my first time going to Patisserie La Cigogne and Rahier Patisserie, both on Bayview Ave. just south of Eglinton. 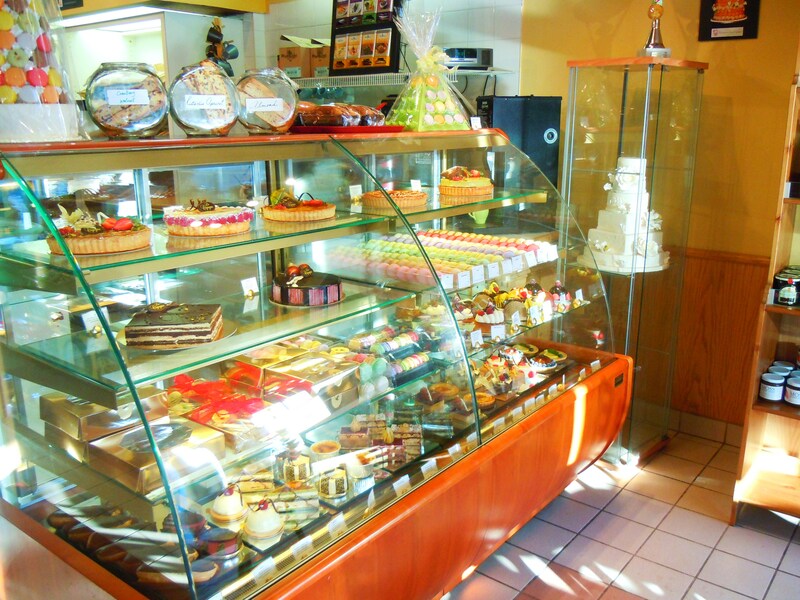 Patisserie La Cigogne took my breath away with their gorgeous display case of colourful macarons, petit gateaux, pastries, and baked goods. It was cold out that day but the beautiful sunshine that streamed in through the front windows just made everything that much brighter and happier. I picked my free one, Caramel (I got to choose whichever flavour I wanted from their entire display case!) and then I bought a set of 6 in a nice box. A bunch of photos later, I walked several shops down to Rahier where I had one of the nicest conversations with the cafe owner, Anita, and picked up my free one (a delicious, fruit concoction of raspberry with lychee, rose, and cream!) and another half a dozen. 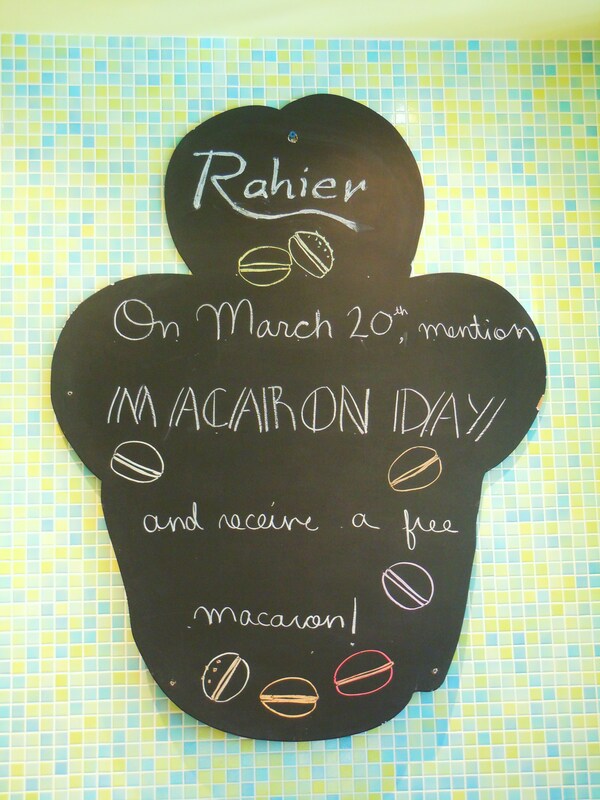 Interestingly enough, Rahier is one of the few patisseries in the city that charge their macarons by weight. There’s no $1.50, $2, or $2.50 type of pricing. Anita explained to me that because everything was made my hand, it was fairer to price them by weight than to price them each. And they turned out to be incredibly reasonable in price! Half a dozen only came up to around $9 (because I’m basing this from memory only, I’d say $8-$10) and there were so many beautiful colours and flavours to choose from including lime, green tea, strawberries and cream, and my personal favourite, CINNAMON HONEY!! 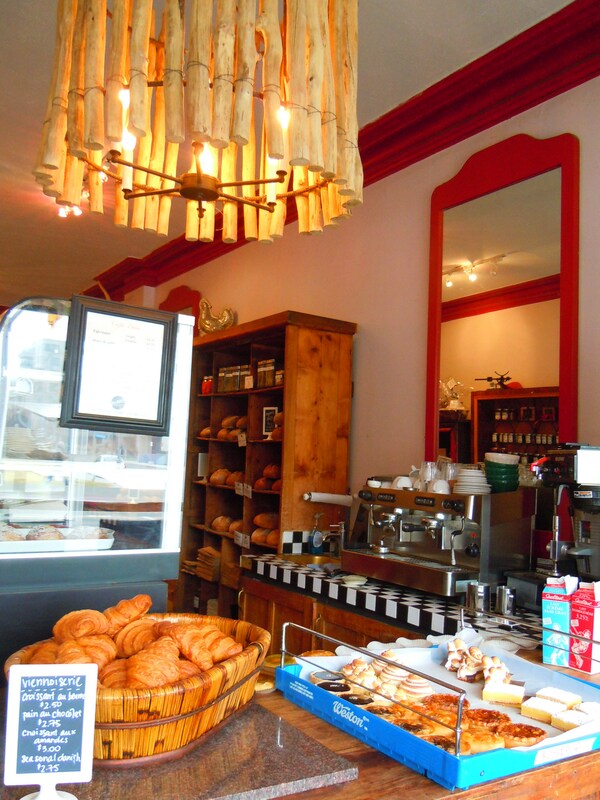 I then jetted to La Bamboche on Manor where I gave Michel (organizer of Macaron Day TO and owner of La Bamboche) a big hug and saw chef Stephen on my way out. 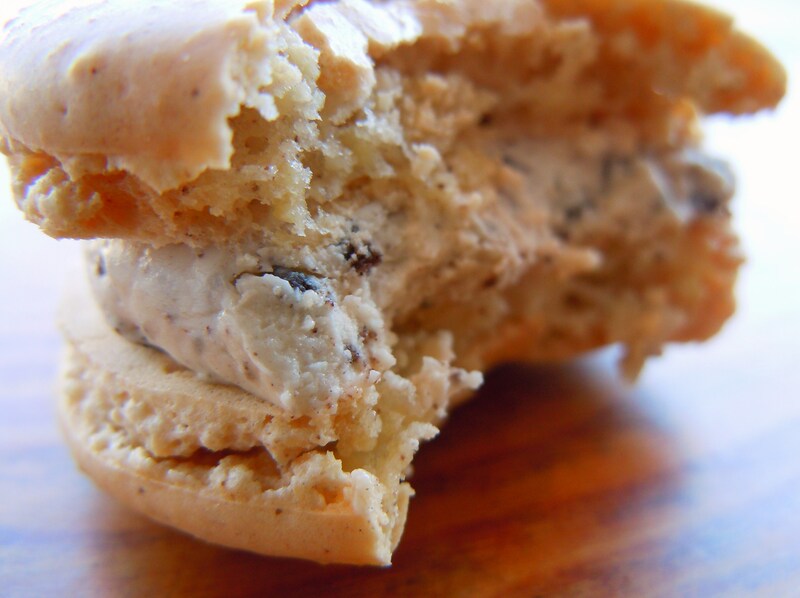 I’ll be doing a separate post just on my macarons from La Bamboche after this one so sit tight! 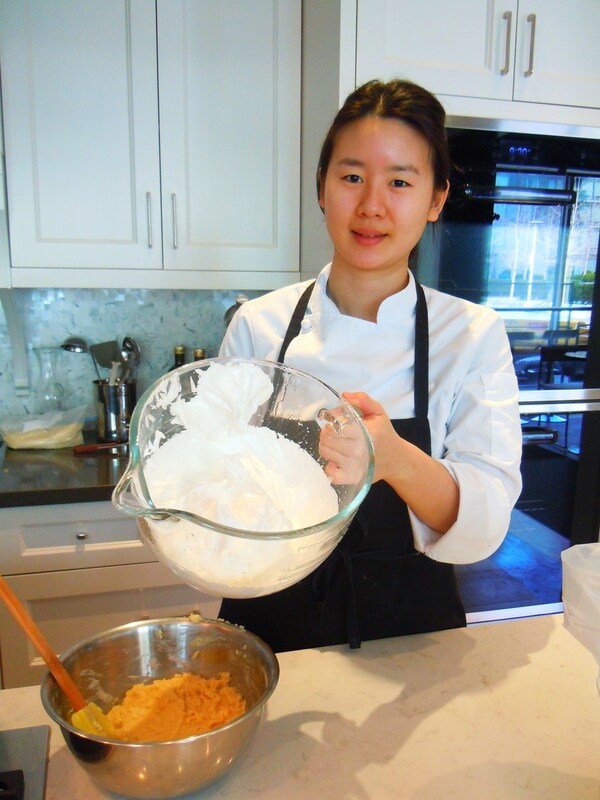 I hit up Yorkville Espresso Bar afterward (not before taking a macaron break inside the underground PATH of Hudson’s Bay Centre though), nabbed their adorable espresso macaron and took some photos of chef YJ preparing macaron batter in the Yorkville Kitchen Studio! 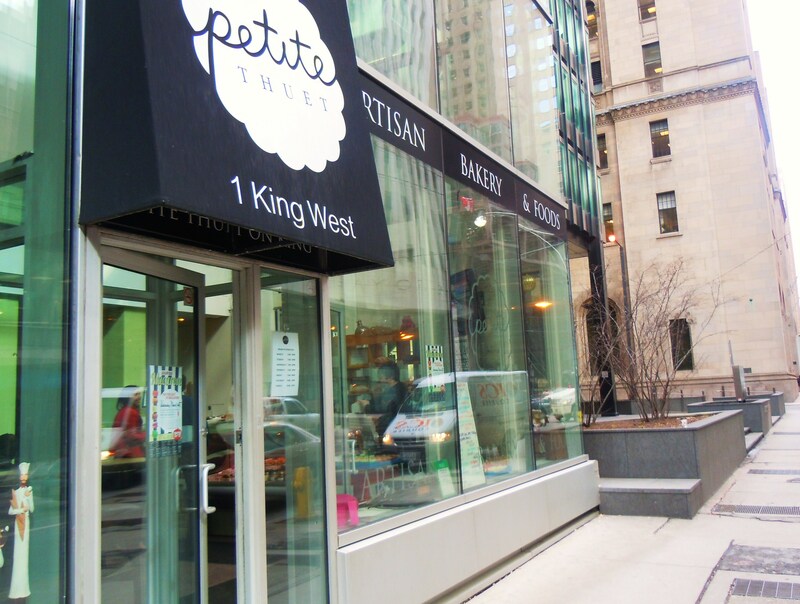 And then finally, I ended my macaron collecting at Petit Thuet at Yonge and King where I was flabbergasted by their gorgeous, rainbow display of macarons that spanned over half the cafe! 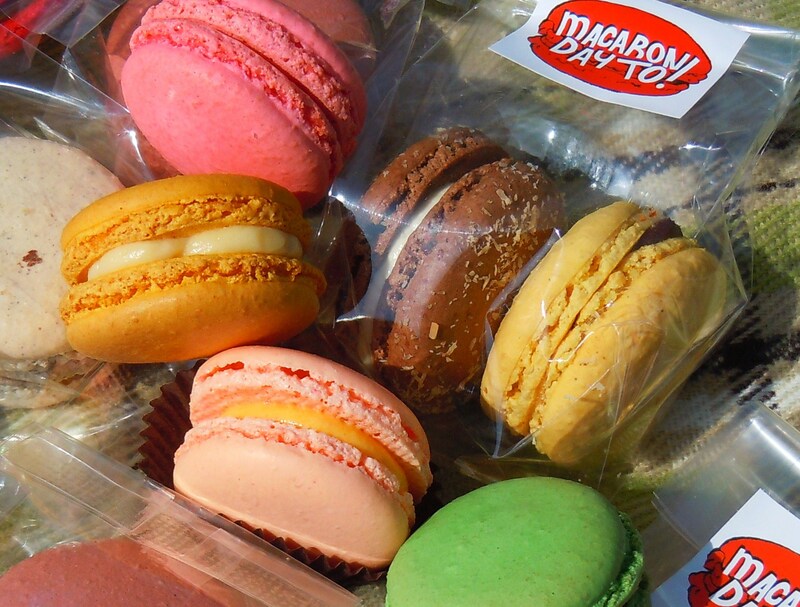 Now, I know Petit Thuet went about Macaron Day a little differently this year. 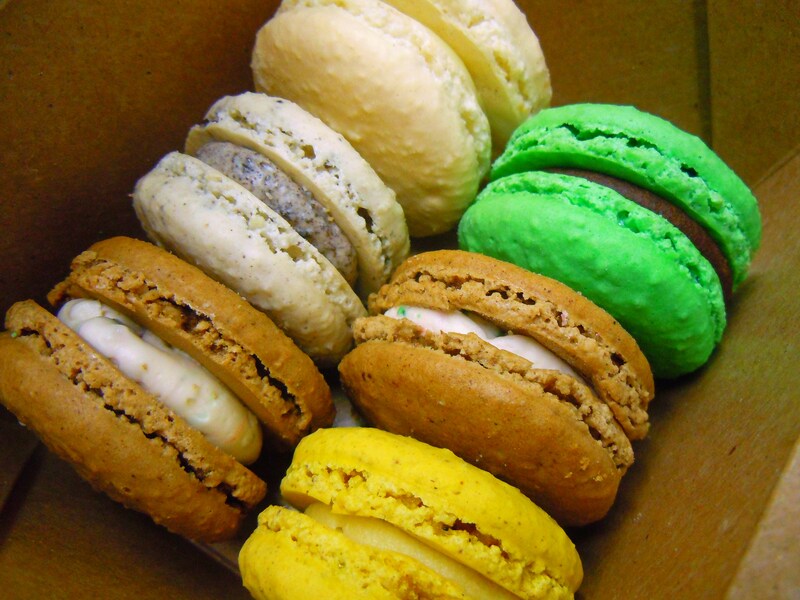 Instead of offering a free macaron to every person who made the request, a single macaron was $2 which went straight to donation, or 5 for the price of $4, meaning that the 5th was free. 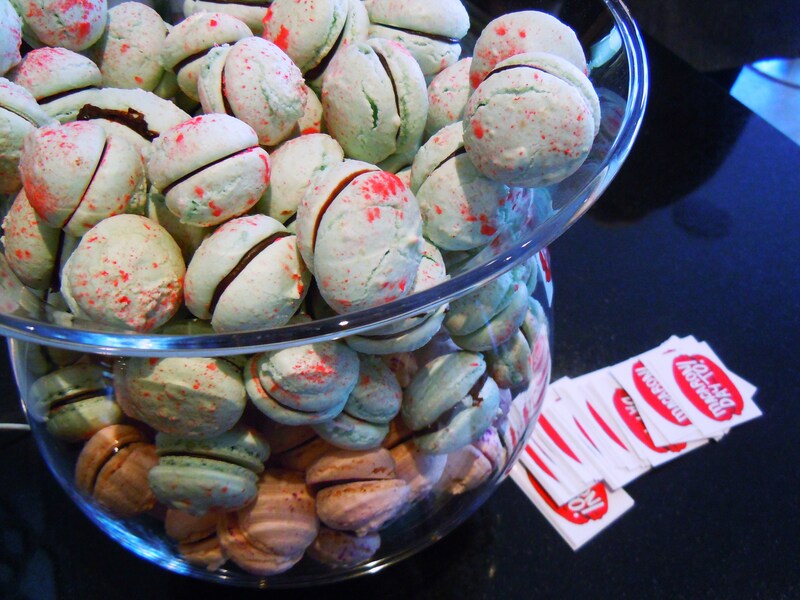 And 20% of all purchases (not just macarons, but all) made at Petit Thuet would be donated to Red Door Family Shelter. 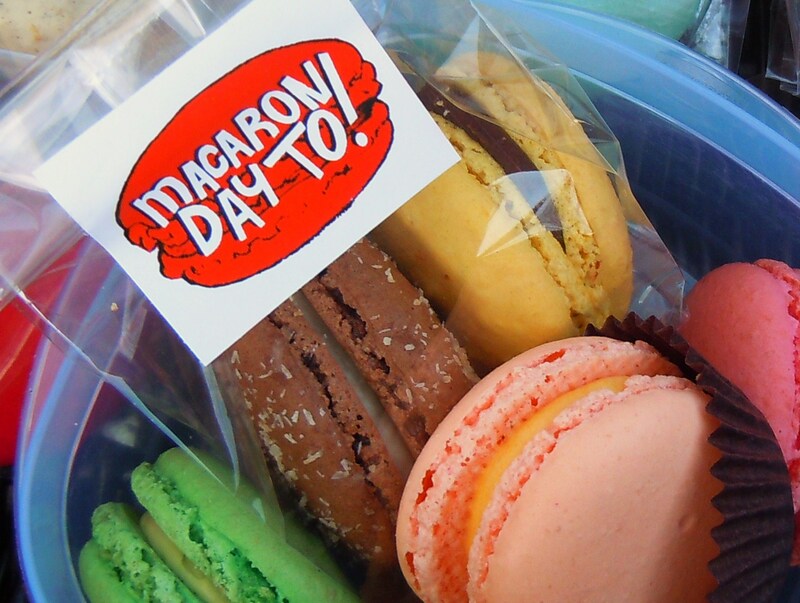 I know some people took issue with this arrangement (a free macaron is a free macaron and they should have honoured this) while others couldn’t care less about it – the event is to benefit Red Door Family Shelter, period, and people shouldn’t be petty about the arrangement for the sake of a free macaron. I have my own opinions about this which I actually don’t wish to divulge here, but I felt like mentioning it because it wouldn’t be fair to pretend like it didn’t exist or to gloss over it. I picked up some fantastic ones during this last collection though, my favourite being the Blueberry Cheesecake! 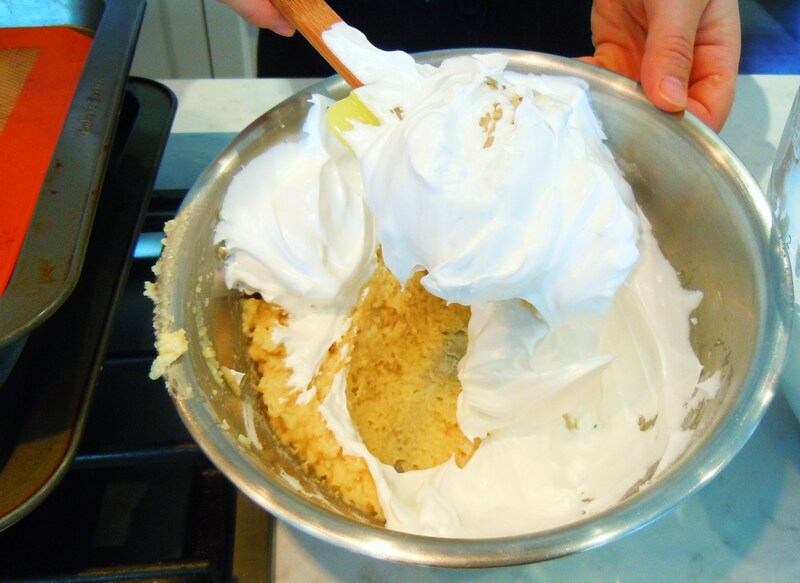 Stay tuned for my photos and post on La Bamboche a la Macaron Day! And of course, the final numbers on how much we raised for Red Door Shelter this year – I can’t wait to find out! We should be getting results some time in April so let’s hope we exceeded last year’s total of $6500 and met our goal of $8000! 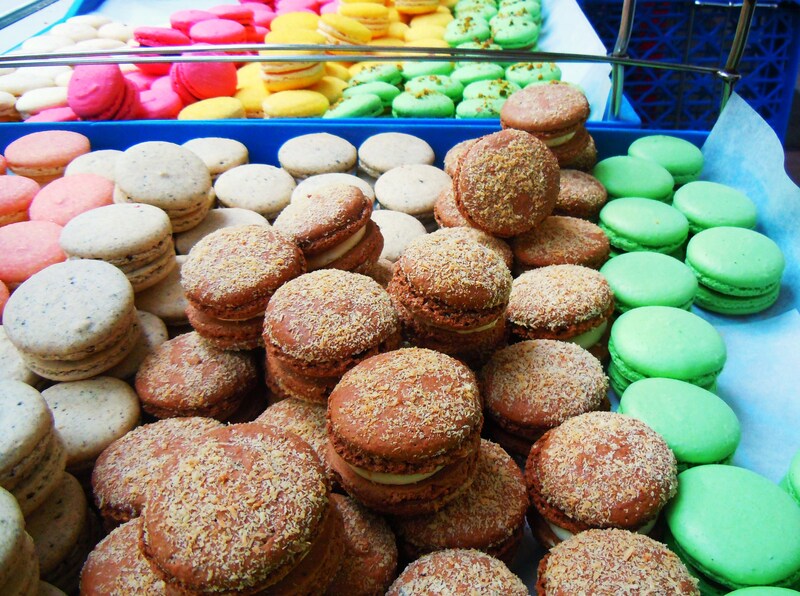 A mesmerizing rainbow display and array of macarons at Petit Thuet! 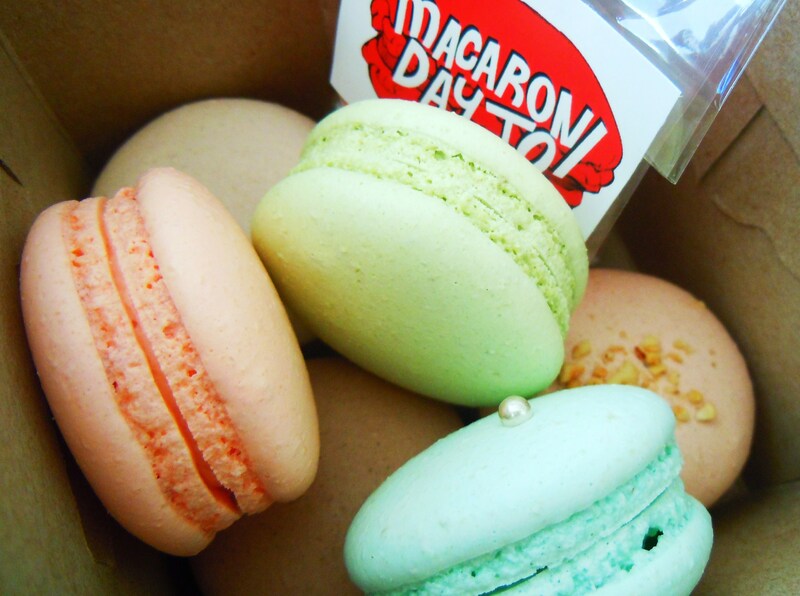 Today, Macaron Day TO 2013, was one of the funnest, happiest days. EVER. And I am still reeling from it and soaking it all in. I’m madly trying to edit my photos as quickly as I can so while I’m doing that, here’s a photo sneak peek of my day today – some of the delicious macarons I got the privilege of tasting for the first time, photos from patisseries I paid my first visit to, and the love, support, and passion that has surrounded this event from day one. 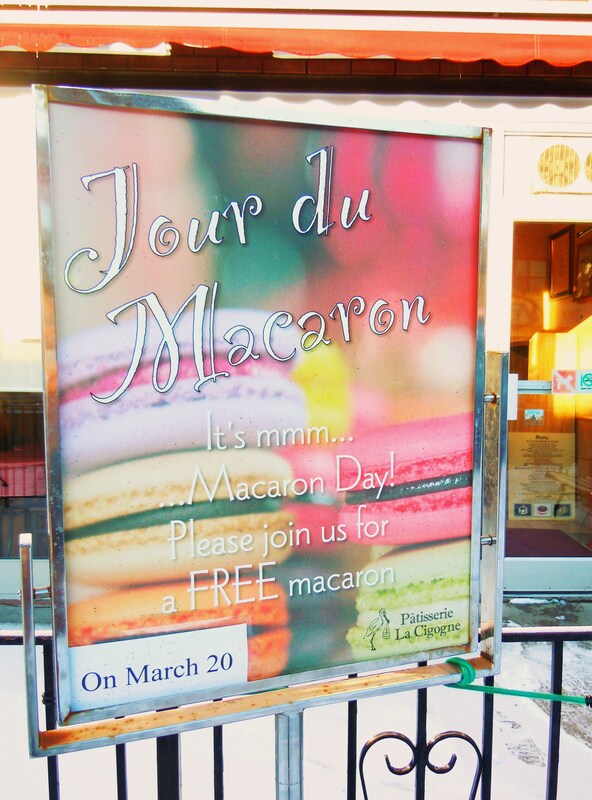 Love all the Macaron Day signage! This one was outside Patisserie La Cigogne on Bayview Ave! 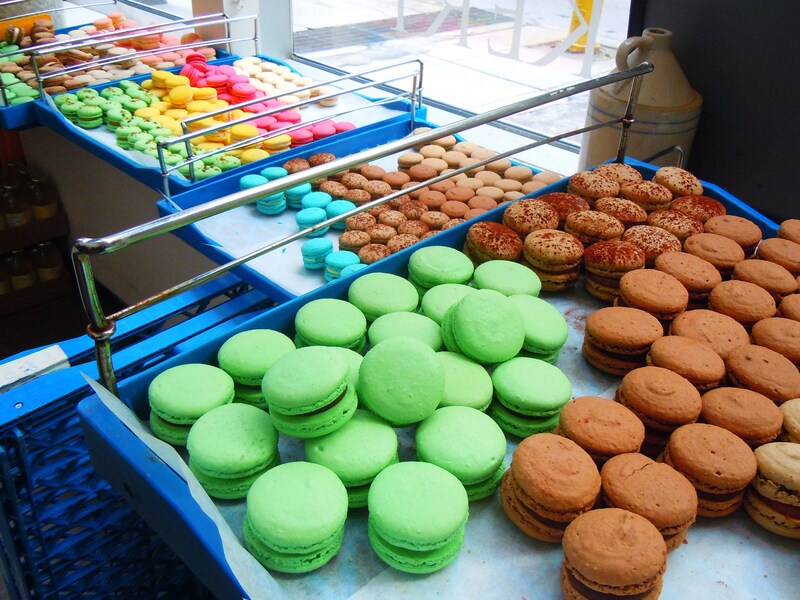 It’s like a macaron bank! 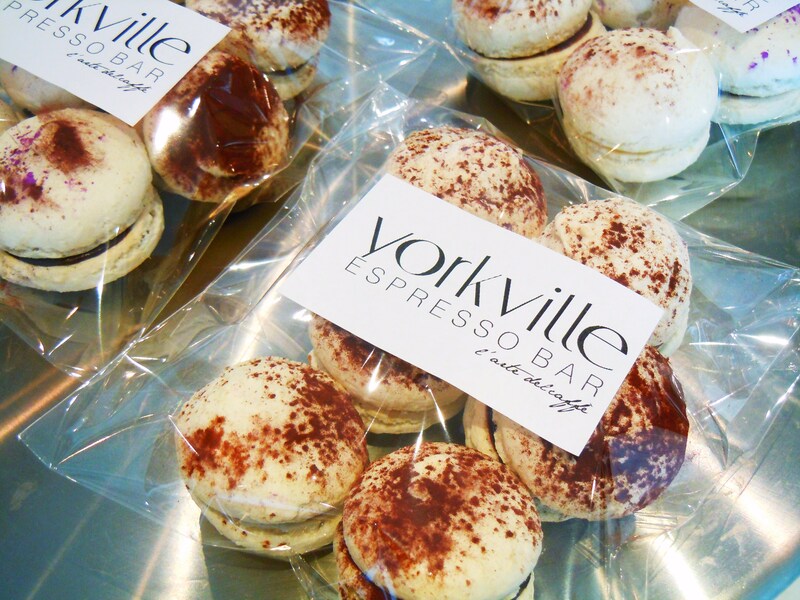 Macarons and stickers at Yorkville Espresso Bar. 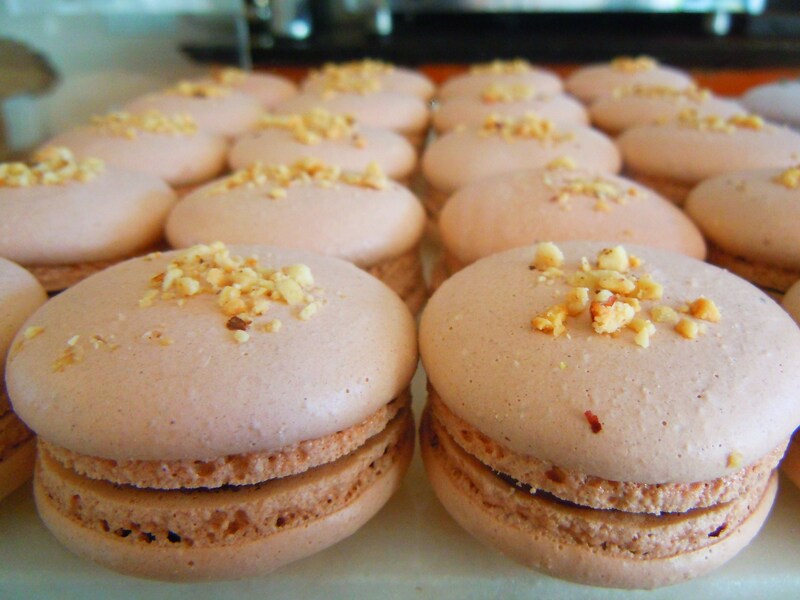 Say hello to Hazelnut Praline from La Bamboche. 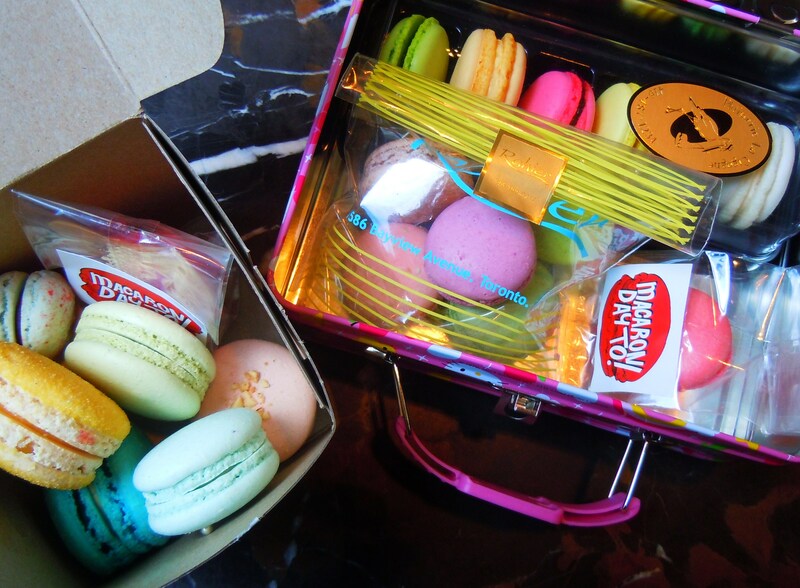 Eating my weight in macarons! 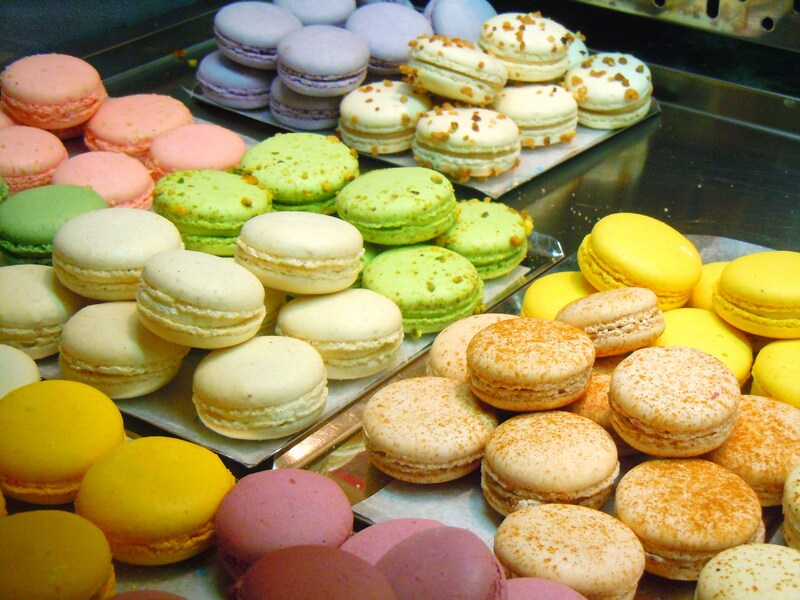 There’s no better way to welcome the first day of spring – pastels and springtime macarons! 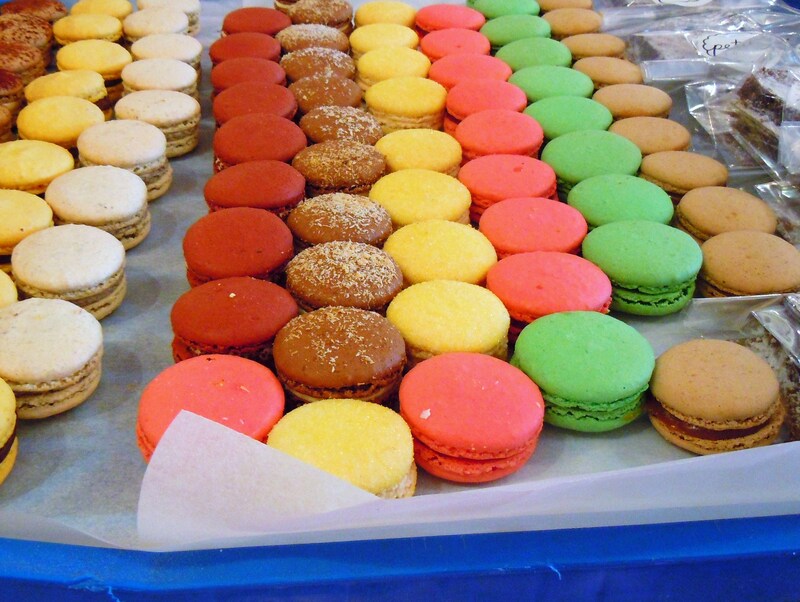 Keep up with all the Macaron Day TO festivities and chatter! 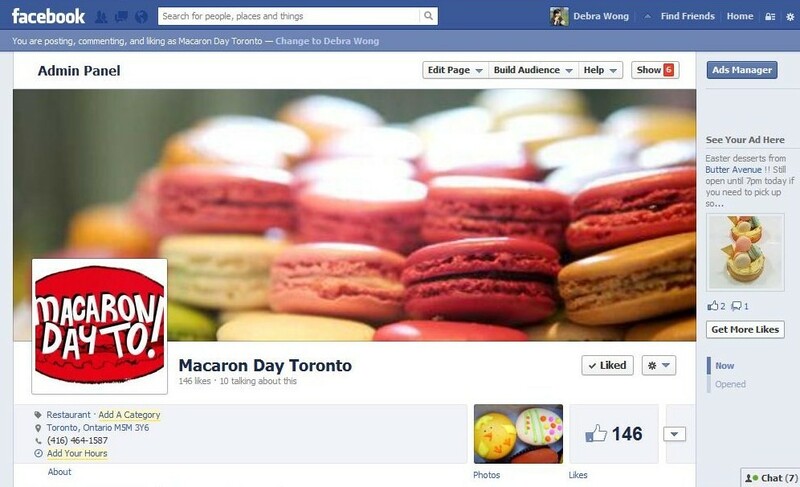 “Like” and follow us on the Macaron Day TO Facebook page, follow us on Twitter @MacaronTO (hastag #macarondayTO), and visit the official website for a list of all the participating patisseries, bakeries and cafes that took part in this year’s event (it’s a fantastic bucket list for those of you who want to try out new spots! 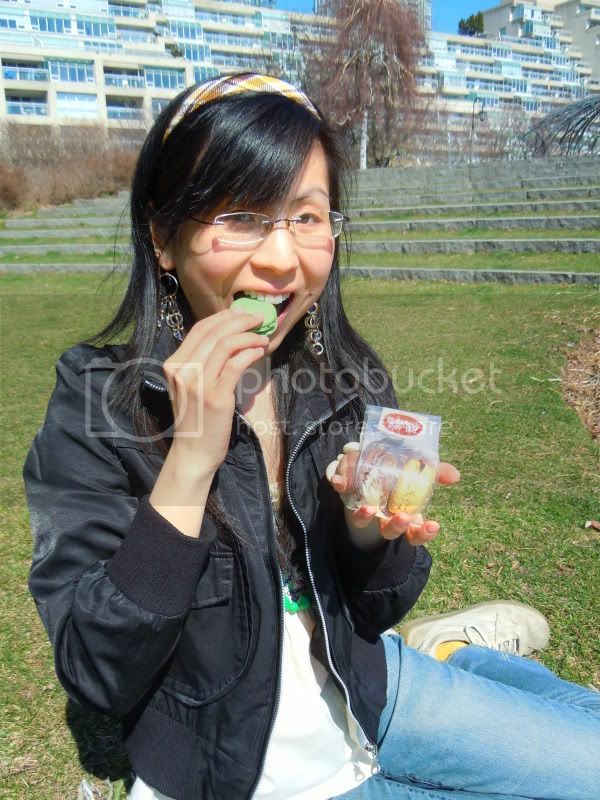 ), your Macaron Day ambassadors (like me! ), and more! 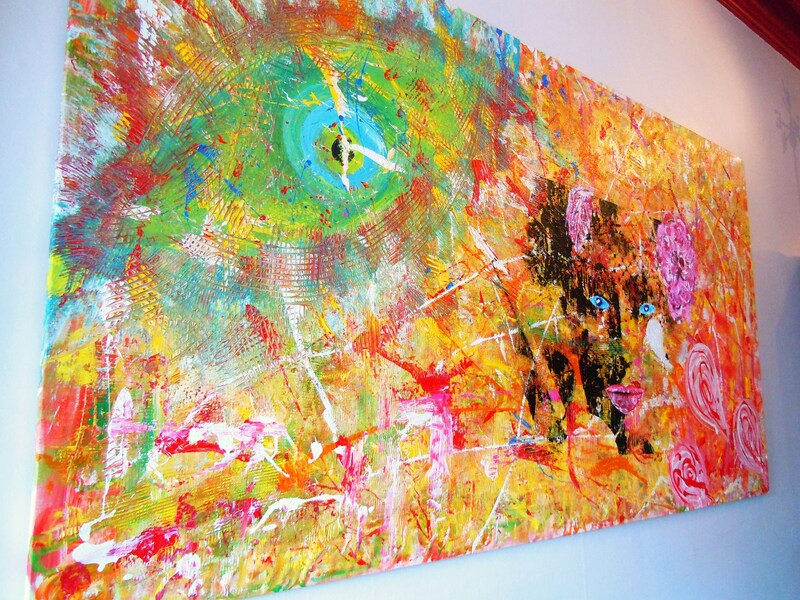 Rainbows and Artwork at Petite Thuet – Yuzu Chocolate & Chocolate Coconut on Macaron Day, Part III! 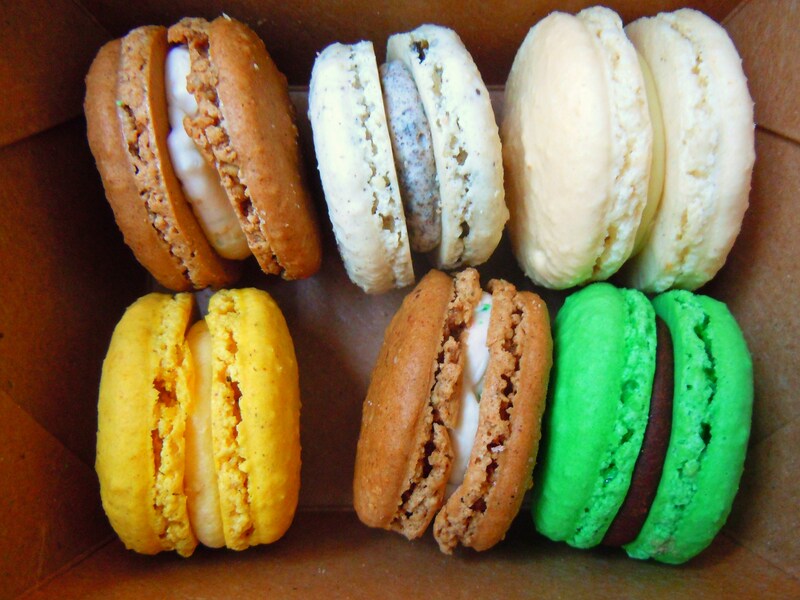 After nearly an entire week of macarons, I have learned something very important: 1) I should only ever bring a macaron home for my brother and 2) putting them in the fridge makes them last longer and they taste just as delicious the day after. And the day after that. And the day after that. That’s right, folks. 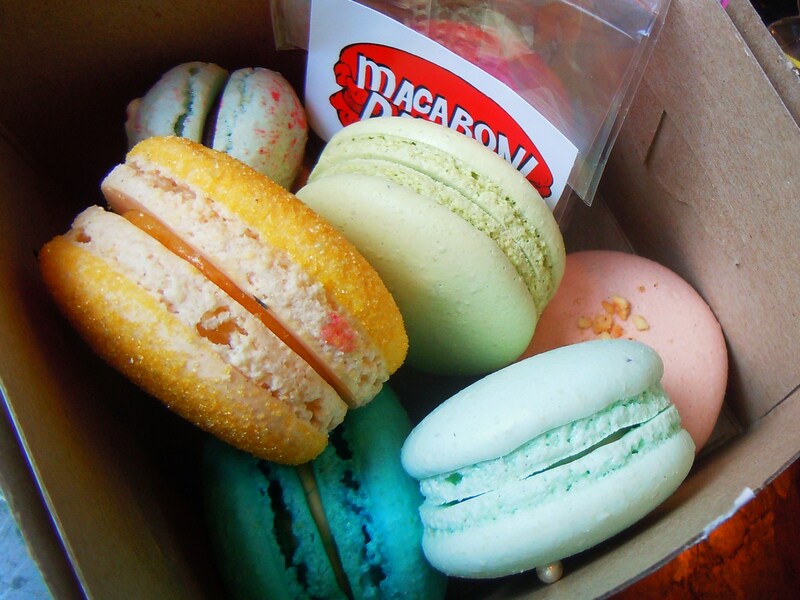 I brought home four perfect, plump, beautiful macarons on Tuesday (I ate four all on my own during the day. Don’t judge me, you know you’d do the same) and I still have one sitting on my kitchen table waiting to be devoured. And most likely, it will be devoured by me. I know, I live a tough life. My family has exasperated me to the point of no return. Anybody else would be empty-handed by now. Or at the very least, swatting somebody else’s hand away for attempting to eat mine. But noooo. 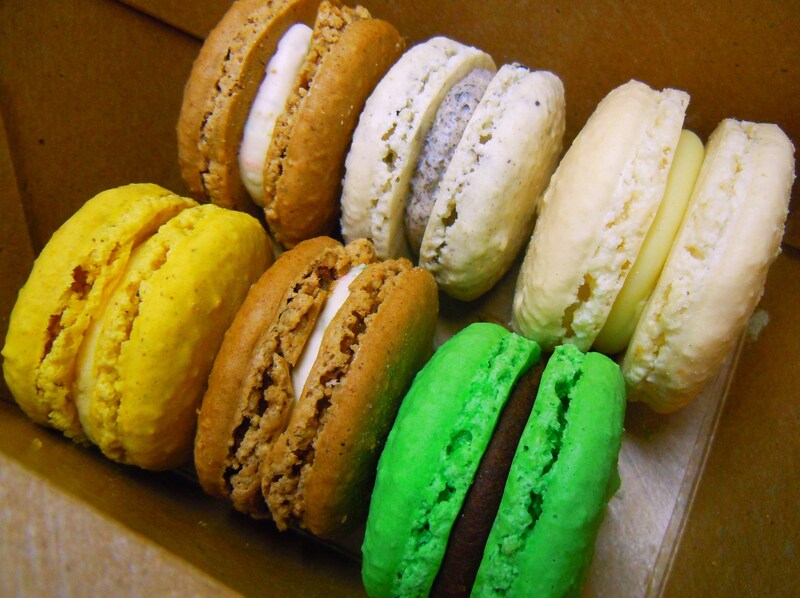 My brother happily ate his, but my parents have repeatedly rejected my beloved macarons day after day and the only reason I didn’t just eat their share after a day is because I didn’t want to be selfish. That, and also a pig. Even if I have boundaries as blurry as they may be. 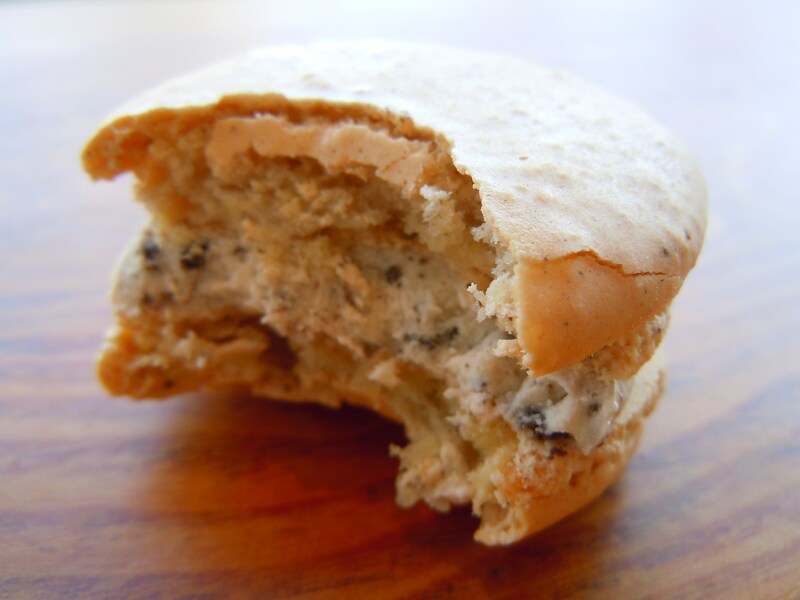 But for goodness sake, I think I’m the only person on this earth who still has a macaron left from Macaron Day! And for that, I am embarrassed. Note to self: save one for the brother and call it a day to save yourself from the face-palming and head-on-wall-banging. Sigh. You’d think that after a day of macaron trick-or-treating and a week of macaron eating I’d be pooped out. Nope, far from it. 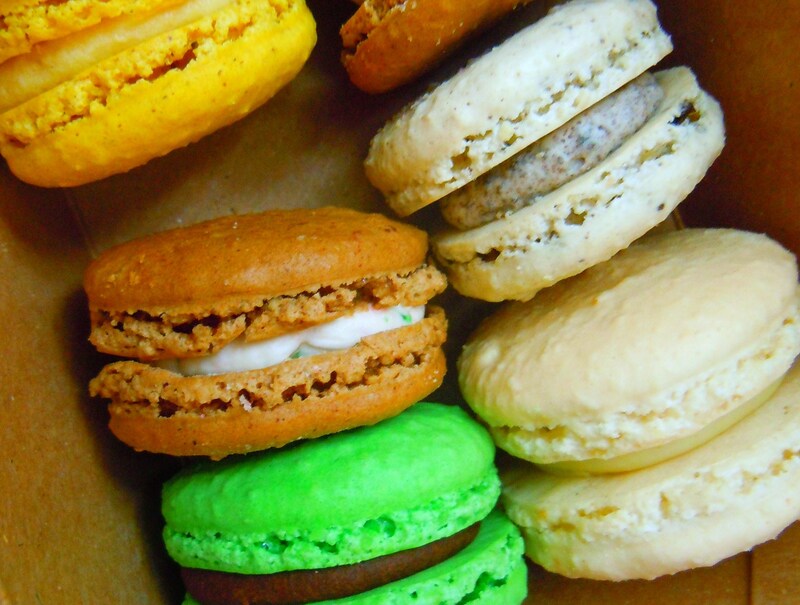 Macaron Day has only fueled my giddiness over macarons and now I can’t get enough. They’re delicate, cute, and as colourful as watercolour paint pucks. They are delightful. This love is going to be just as bad as cupcakes, if not worse. 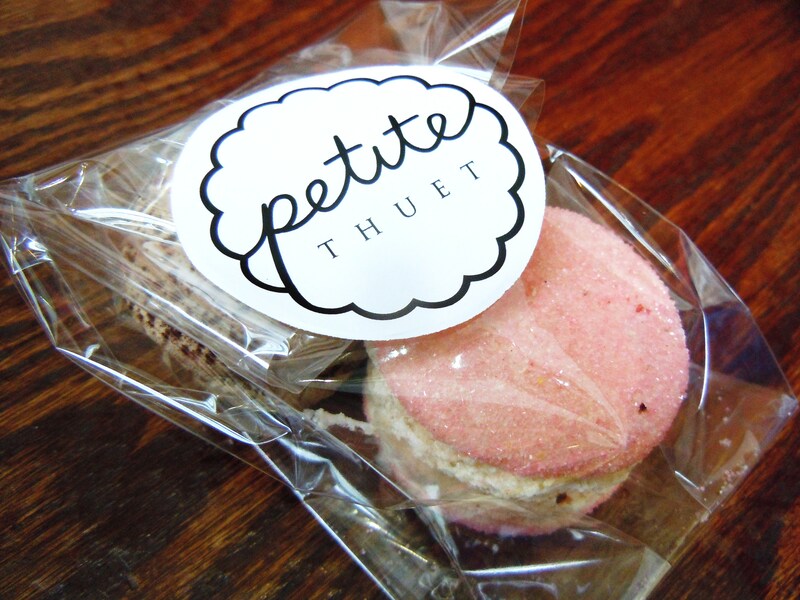 One of the very first macaron posts I wrote on the blog was for Petit Thuet but this time around, I have the goods from a different location! 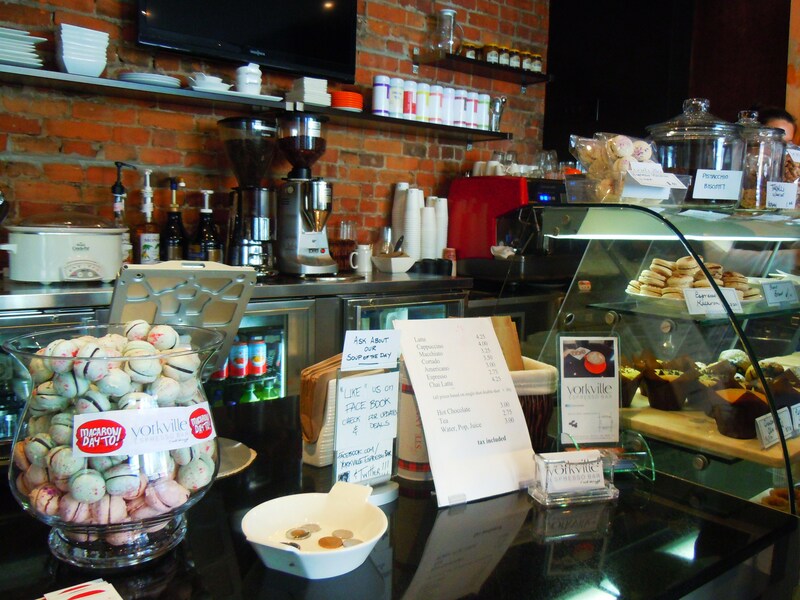 On Macaron Day, I paid a visit to the Rosedale location for the first time and I really fell in love with the space, much more so than the one on King St. in the financial district. 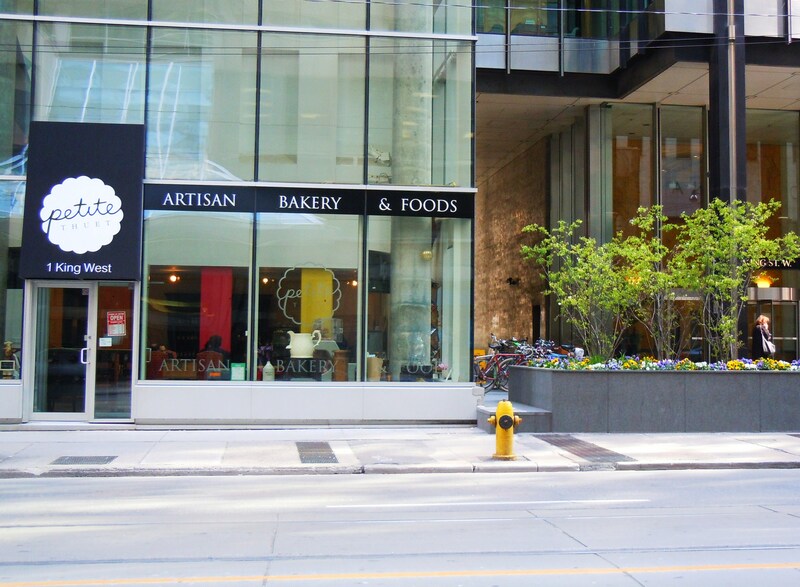 The Rosedale location, located in the heart of midtown Toronto on Yonge Street, has beautiful paintings and artwork on the walls and gorgeous wooden accents including a wooden light fixture and a wooden table bench by the storefront window. The space is a little sunnier with more pop and personality to it and even though it’s small, I like it a lot. 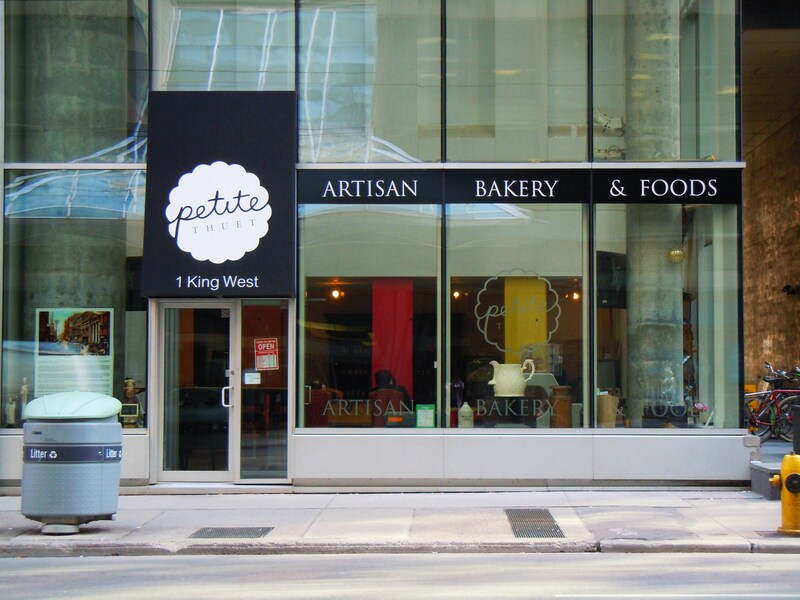 Petit Thuet is a French bakery/boulangerie and gourmet shop that serves croissants, baked goods, pastries, and desserts, along with gourmet meats, jarred preserves, salads, and more. 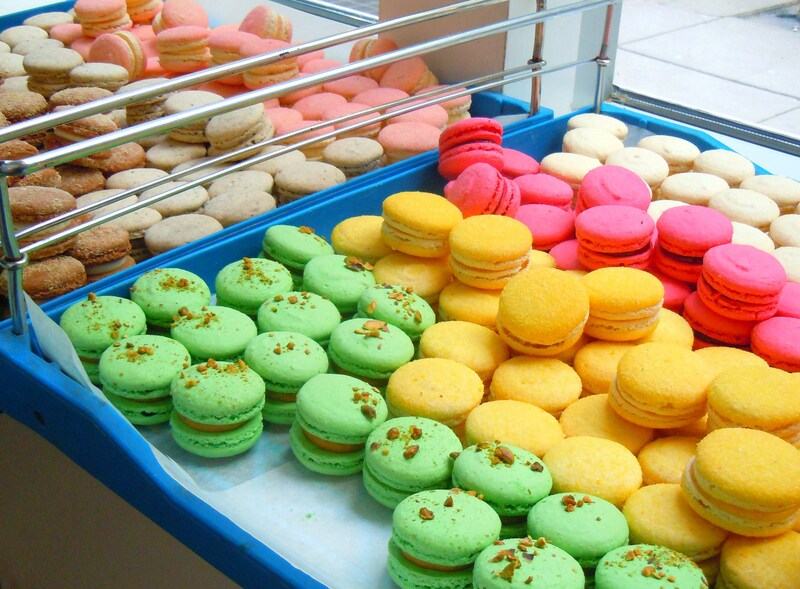 Pastries and desserts include lemon bars, meringue tarts, fruit tarts, danishes, almond pastries, small cakes, and the ever popular macarons that have put Petit Thuet on the macaron map. 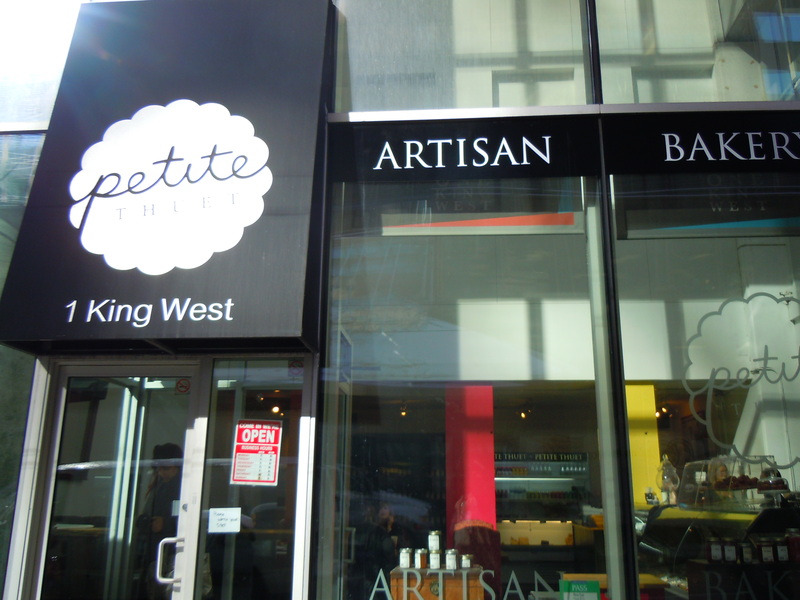 My very first Petit Thuet macaron was their rosewater one and while I really enjoyed it then, I LOVED the macarons I picked out on Tuesday even more! 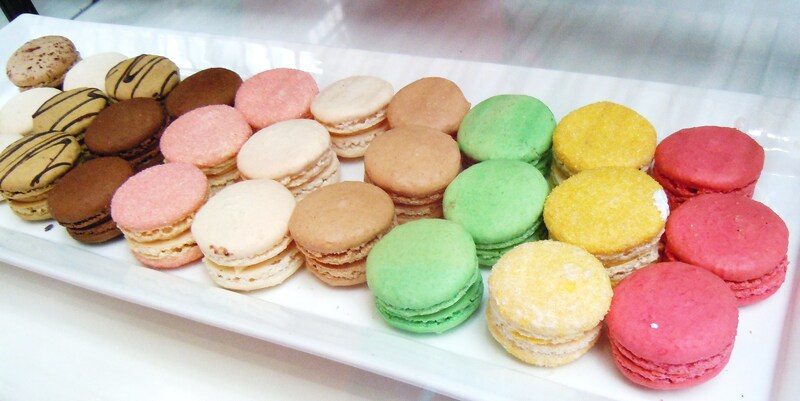 There was literally a rainbow of macarons to choose from on Macaron Day and right off the bat, I picked up on the noticable differences. The macarons were larger and plumper than I remember and there were a number of flavours that were completely new and exciting to me! I snatched a bright yellow yuzu chocolate macaron (the yellow one you see on the far left in the macaron photo up top) and a creamy chocolate cocoa coconut one (the chocolate one with the toasted sprinkled coconut on top) and there were plenty of others that looked sweet and delicious. 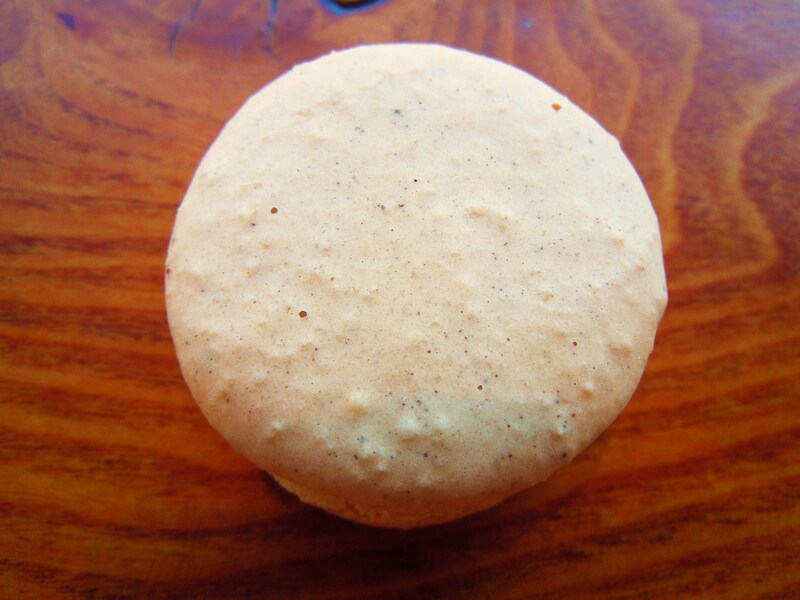 My brother took the yuzu chocolate (his first macaron ever!) while we shared the chocolate coconut between the two of us and both were deeply loved. While I can’t give you an excited assessment of the yuzu chocolate yet, I can tell you that my brother was over the moon over it and loved it to itty bitty pieces. He prefers citrus fruits over others such as berries and he’s a mega chocoholic so it was perfect for him. It was his very time eating a macaron and he was hooked after the first bite. 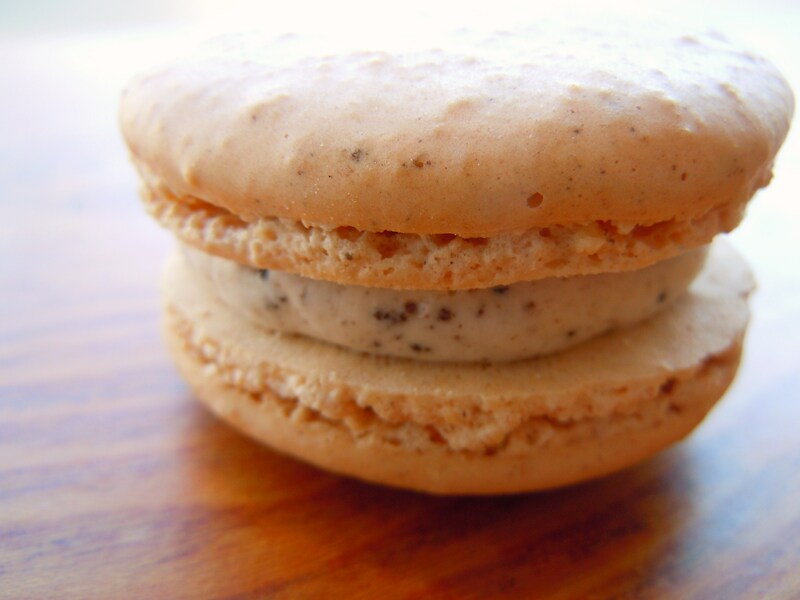 And if you love coconut milk, the chocolate coconut macaron needs to be in your life. 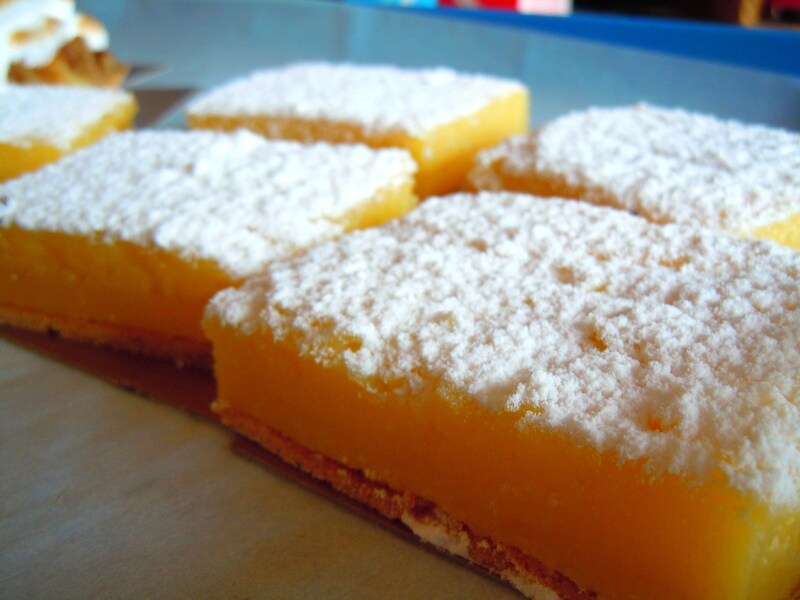 Coconut and lemon are my two dessert flavour weaknesses so this made me all sorts of happy, especially because the filling was so creamy and so true to what coconut milk tastes like. 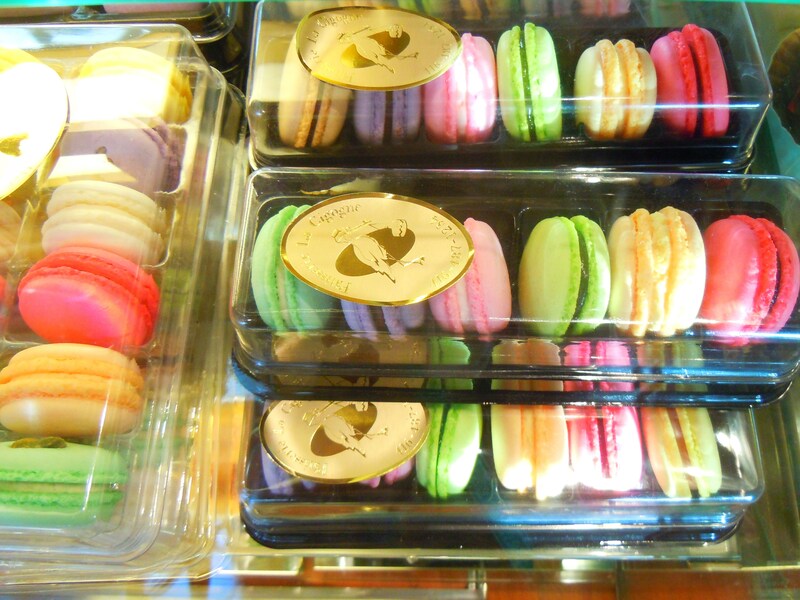 Macarons are $2.20 a piece which puts them in the middle price range as macarons in the city go for $1.50 to $3. The new flavours and bigger sizes took me by surprise in the best way possible and I couldn’t be happier with the changes and additions. They are fabulous and I am going to have the hardest time staying away. 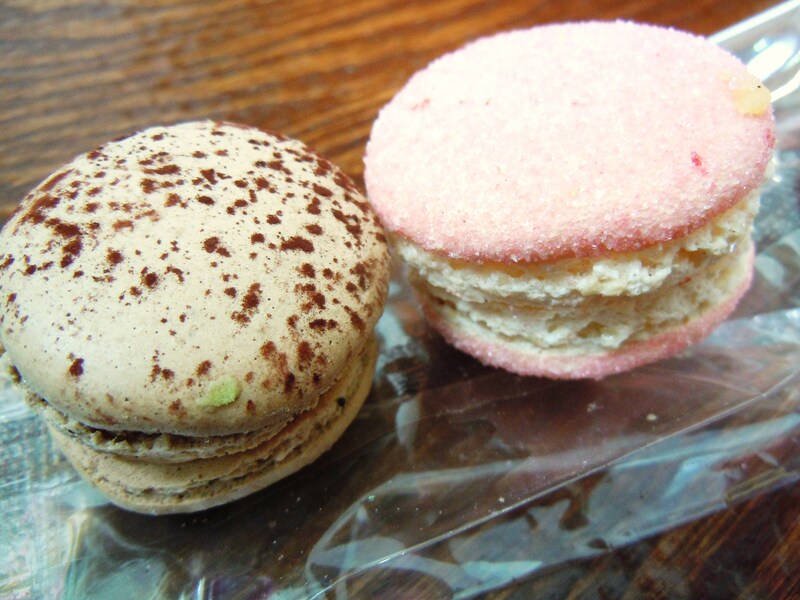 Between Petit Thuet, La Bamboche, Bobbette & Belle, and other patisseries, I am going to be one very macaron-occupied girl for quite some time! The last time I was this excited about a food event was last Septemeber during Vegetarian Food Fair and Macaron Day totally lived up to the fun and excitement I was expecting, and then some. I had some of the most delicious flavours, the funnest time taking photos, and sharing the sweet treat stories with all of you and I can’t wait to do it all again next year now that the event has come to the city. 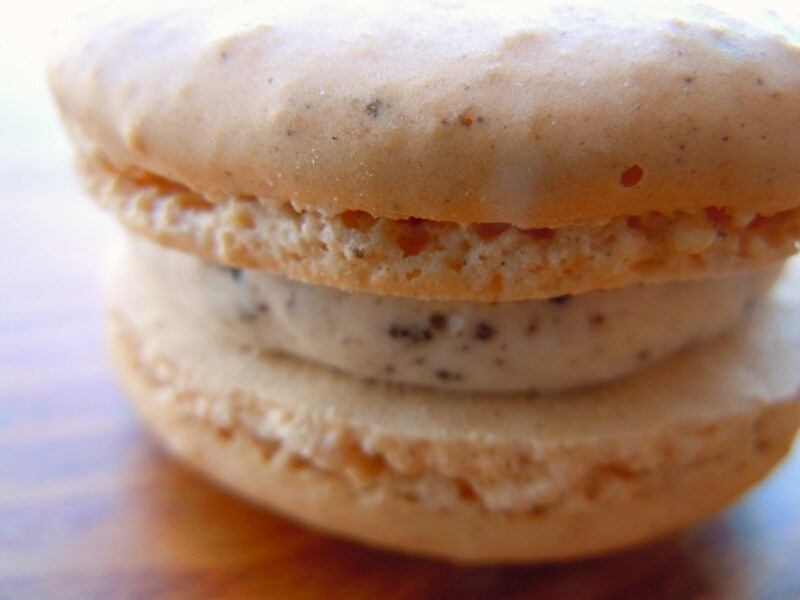 I hope you all enjoyed the macaron posts these last few days – it’s the beginning of a whole new delicious adventure!